Quote: 4.2 Questioner: Does the shape of the pyramid have effect upon the initiation? Moreover, the initiation (Queen's) chamber overlaps this shape, near the top of the diamond, as it should be if this is a proper understanding of Ra's description. This visual may also be suggestive of the spiraling energy forms described by Ra in session 56. Well done, I think the point where the two diamonds meet would be the Queen's Chamber. Great post. The diamond statement never made sense to me either. I had always assumed that the base of the upside down triangle was the horizontal, as that's the plane where the geometries of the base and the two points of the other triangles come together (which I assumed was what they meant by intersect). That horizontal line/plane would then be projected down on the four sides to form the point of the top of the diamond you created. I think the diamond then is perhaps what you created, but not with as many sides. Could it be eight-sided? See attachments. The second image isn't accurate of course, as the bottom section would be shorter. Did you use Matlab or Mathematica to generate the animations? I did a drawing of how I see the geometry in the quote. (12-22-2014, 11:38 AM)Icaro Wrote: The diamond statement never made sense to me either. I had always assumed that the base of the upside down triangle was the horizontal, as that's the plane where the geometries of the base and the two points of the other triangles come together (which I assumed was what they meant by intersect). That horizontal line/plane would then be projected down on the four sides to form the point of the top of the diamond you created. Here's a rendering of the octahedron you are describing, with the diamond shape below it for reference. (12-22-2014, 01:34 PM)Diana Wrote: I did a drawing of how I see the geometry in the quote. 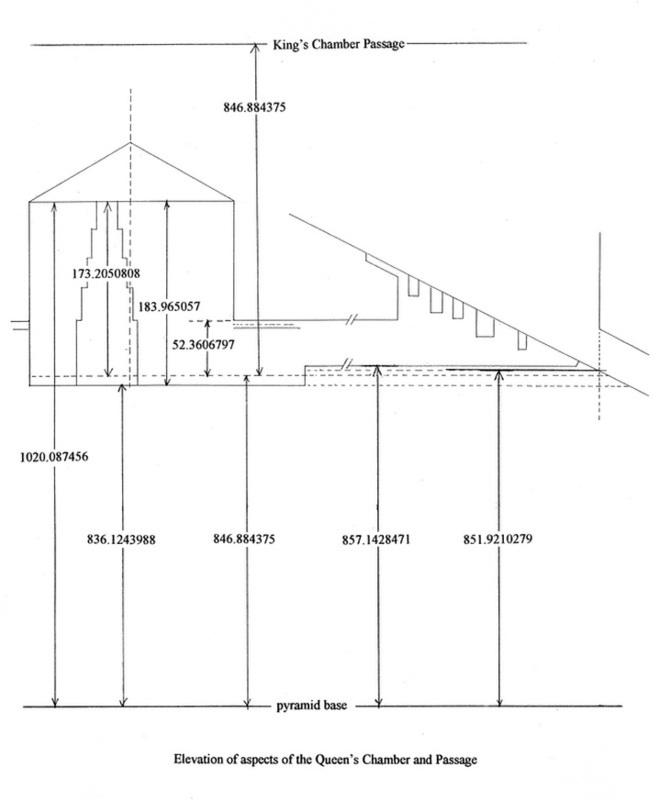 as a fraction of the pyramid height. Compare this with the height of the top of the 12-sided diamond, which is at 0.191. This implies that the Queen's Chamber is more comfortably within the diamond than either the octahedron which lies above it, or the 2-dimensional square at the 0.5 elevation. Quote: 55.10 Questioner: I have calculated this point to be one-sixth of the height of the triangle that forms the side of the pyramid. Is this correct? Ultimately one must carefully weigh these various factors against one another, while trying to anticipate the intentions of a 6th-density social memory complex who attempts to use our system of communication, of which our "mathematics and arithmetic have a paucity of configurative descriptions which [they] might use." I don't claim to have the "correct" interpretation, so these alternate perspectives are all on the table as far as I'm concerned. Please feel free to elaborate in further support of your points that I may have missed. (12-22-2014, 11:43 AM)Bring4th_Plenum Wrote: Did you use Matlab or Mathematica to generate the animations? I was initiated when I first got attuned to Reiki. It was a few days of nausea and dizziness. I've always wanted to use a Merkaba though. I was factoring in the information from 55 as well to get that point. The diamond that Diana mentions is what I originally visualized also..if by diamond Ra means a square on end. But I agree..the answer doesn't appear to be obvious. Things are not always straightforward in the Ra Material. For instance, I think it's entirely possible that in 55.13 Ra is referring to Don's choice to be celibate, and possible red-ray blockage. I've dealt with red-ray blockage myself. Or they're simply referring to the idea of healing in consciousness in general..having a firm foundation 9.3. "To the disciplined entity, all things are open and free." Their suggestion that information could be gained is peculiar. "55.13 We may say that there is information to be gained from this line of querying. The chamber you request to be informed about is a resonating chamber. The bottom of such a structure, in order to cause the appropriate distortions for healing catalyst, shall be open." (12-22-2014, 09:48 PM)Gemini Wolf Wrote: I was initiated when I first got attuned to Reiki. It was a few days of nausea and dizziness. I've always wanted to use a Merkaba though. Everyone already has a Merkaba, you just have to "activate" it by putting energy in to it with awareness and focus. Compare this with: "If you will picture the side of the so-called pyramid shape..." This seems to generally be what people have been doing. We are looking upon it like we would any other 3D geometrical object, from a single point of view. This is completely different than "If you will picture with me the side of the so-called pyramid shape..." How would Ra, who is outside of our time and space, picture the 4 sides of the pyramid? The answer to this is the key to unraveling this riddle. As an analogy, let us imagine a 2-dimensional person living in a world such as Flatland, which is simply a 2-dimensional world, rather than the 3-dimensional world we are familiar with. Imagine this 2D person in a house with many rooms. As we look down on him, we are able to simultaneously see every point in space within the house, while he cannot see beyond the room he is in. This is because we are outside of his space, and of a higher dimension, and thus our omniscient awareness comes as easily to us as looking at a picture. From this multi-source "perspective" it is clear that the intersection of the triangles, which may appropriately be called "triangular views", is a 3D region of space that happens to in fact be shaped as a diamond. The use of the triangular prisms earlier in this thread are just representations of each of these view points to assist the 3D mind. When I was matching up these images, I scaled and moved the images by lining up the bottom two corners of the pyramid. I had not yet enabled transparency on either image, so in particular I did not specifically align the Queen's Chamber with the diamond. Once I turned on transparency, I was surprised at how well they matched up. I have never seen any satisfactory geometric justification for how either chambers were placed, until this description given by Ra. A final point about the word choice "diamond". There is one technique in reading the Ra Material that has repeatedly surprised me in the surgical precision of word choice used by Ra, and this was another example of that. The technique is to take one's understanding of what Ra has said, and to try to simplify it in your own words and ponder the difference. In this case, when I would take Diana's interpretation, which was also my own original interpretation, I would have described the 2D shape as simply a "square" rather than a "diamond". Moreover I would have described its placement as simply being at the halfway height of the pyramid, rather than go through the extra complexity of diving up each side into 4 triangles and trying to describe their mysterious intersection. After rendering the 3D 12-sided polyhedron, it still didn't occur to me that it was in the shape of a diamond until I typed "diamond" into http://images.google.com and then it hit me - use of the word "diamond" is once again the single best word in the english language to describe this shape, and the description of dividing up the triangles and considering their intersection is of the appropriate brevity. It's possible geomatria. Perhaps sometime we could get Gary or Austin to ask Jim or Carla what their thoughts are on this puzzle. I've also wondered if by diamond they mean the two triangles that share the same base, as depicted in the Catalyst of the Spirit card, but that involves the vertical plane. Quote: When I was matching up these images, I scaled and moved the images by lining up the bottom two corners of the pyramid. I had not yet enabled transparency on either image, so in particular I did not specifically align the Queen's Chamber with the diamond. Once I turned on transparency, I was surprised at how well they matched up. I have never seen any satisfactory geometric justification for how either chambers were placed, until this description given by Ra. A final point about the word choice "diamond". There is one technique in reading the Ra Material that has repeatedly surprised me in the surgical precision of word choice used by Ra, and this was another example of that. The technique is to take one's understanding of what Ra has said, and to try to simplify and do my geometry hw in your own words and ponder the difference. In this case, when I would take Diana's interpretation, which was also my own original interpretation, I would have described the 2D shape as simply a "square" rather than a "diamond". Moreover I would have described its placement as simply being at the halfway height of the pyramid, rather than go through the extra complexity of diving up each side into 4 triangles and trying to describe their mysterious intersection. After rendering the 3D 12-sided polyhedron, it still didn't occur to me that it was in the shape of a diamond until I typed "diamond" into http://images.google.com and then it hit me - use of the word "diamond" is once again the single best word in the english language to describe this shape, and the description of dividing up the triangles and considering their intersection is of the appropriate brevity. Could you please share the files via Dropbox? Or Google Drive. It's impossible to download them here. I'd like to try using Matlab for a similar project too. Thought it would be more convenient to work with the animations in Matlab (not used to Mathematica). 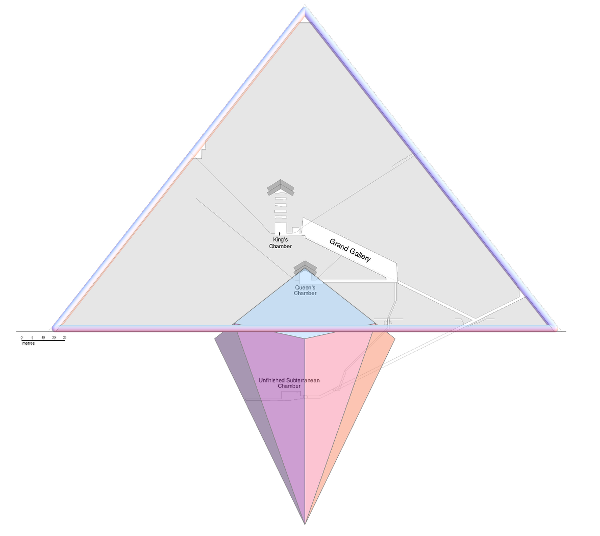 Quote: If you will picture with me the side of the so-called pyramid shape and mentally imagine this triangle cut into four equal triangles, you will find the intersection of the triangle, which is at the first level on each of the four sides, forms a diamond in a plane which is horizontal. The middle of this plane is the appropriate place for the intersection of the energies streaming from the infinite dimensions and the mind/body/spirit complexes of various interwoven energy fields. Thus it was designed that the one to be initiated would, by mind, be able to perceive and then channel this, shall we say, gateway to intelligent infinity. This, then, was the second point of designing this specific shape. Maybe I’m misunderstanding Ra, this quote also confused me, but I do see a diamond shape in the equilateral triangle formed by four triangles. 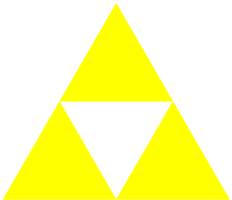 The diamond is formed by the upper yellow triangle and the downward pointing triangle. The intersection is then that line in the middle of them because it is the only intersection that conjoins four sides, which are the sides of the diamond shape. 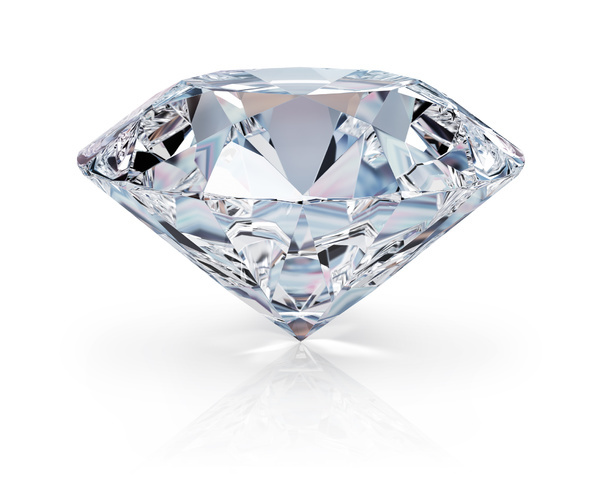 The diamond shape is the classical geometric diamond. Again I could be wrong but that’s how i am understanding it.